His Word Christian Academy (HWCA) in Smith Valley is offering Preschool and Kindergarten at no cost to the family. The tuition is being funded by Smith Valley Baptist Church. The school location is 888 Hudson Way, Smith NV. Your child must be 3 yrs old by Sept. 30th for Preschool or 5 yrs old for Kindergarten. Our program focuses on Bible, letter & number recognition, beginning reading, PE, social studies and hands-on math & science. HWCA is a ministry of Smith Valley Baptist Church and is a non-profit, state licensed organization that can customize each student’s learning experience due to our small teacher-student ratio. Please contact Diane Herrand 465-9399 if you would like more information. A petition to separate the Cemetery Board for Hillcrest from the Smith Valley advisory Board is available to sign at the Smith Valley Real Estate Office at 2803 HWY 208 across from the Post Office Wednesday –Saturday 9am to 3pm. Copy of petition attached, or you can contact us for alternative methods to sign. No Meeting tonight, enjoy your evening and cheer on the grads to be! Until Further notice, meeting is Cancelled due to Open Meeting Law Posting Requirements issue. We will resend the agenda with the new date, and hope to see you there. Due to Supporting material too large to send electronically, Agenda is being sent again alone, and a copy of the material will be available for review at the meeting. Hard copies may be available from Maureen Williss by request to mwilliss. 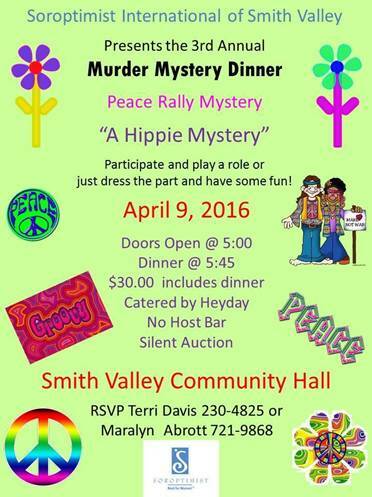 Annual SISV Murder Mystery Dinner this Saturday! We haven’t spoken in quite some time, but I wanted to make sure you were all aware that the Third Annual SISV Murder Mysterday Dinner is coming up this Saturday! We are going to have a great dinner and a groovy good time! Hope to see you there! Participation is highly encouraged, so call to get your groove on!